Vancouver Island’s Best Kept Secret. In the 1950s, the Adams had a great vision. They decided to turn an old log sort into a salmon fishing destination called the Adam’s Resort. By the late 1950s, they had visitors from all over the world at the resort, catching the elusive Big Tyee salmon. With cabins on the beach and a main lodge, the Adams family put Brown Bay on the map of Vancouver Island, BC. Years later in 2007, the resort was purchased by Recourt BV to fulfill and continue the Adams’ dream of maintaining the perfect outdoor luxury cabin resort on Vancouver Island, BC. Even though the old, original lodge and beach cabins are long gone, Willem and Erica Recourt, together with their daughter Esther and son-in-law Brent Hollink, decided it was time to bring the old and new dream back to reality again. Since the days of the Adams’ Resort, the RV Park was constructed. Reaching the highest of quality standards, the RV park boasts many amenities that guests are able to enjoy. These amenities include 60 full-service concrete pad sites, an octagon clubhouse to host all types of different functions and events, a hot tub, a fitness center, a playground, and laundry and shower facilities. We have further expanded the Marina and can accommodate vessels up to 100’. With a boat launch and parking facilities, you can escape having to travel through the Seymour Narrows to reach one of the best Salmon fishing locations of Vancouver Island. The marina office has all your boating and fishing needs covered, including fuel, tackle, ice, clothing, boat supplies and the much needed local knowledge of the area, to have a fantastic day out on the water. Hungry? Well, the Narrows Floating Restaurant was completely renovated in 2012 to the delight of our visitors. Since re-opening, the restaurant has quickly become the talk of the town thanks to its “All You Can Eat Crab” nights and delicious “West Coast” influenced menu. With the popularity of our “All You Can Eat Crab” nights, we strongly suggest reserving a table, as it is often a sold out event. The Recourt family knew the one thing that was missing from the “old” days was the lack of accommodation, the old lodge burned down in the 80s. Therefore, in 2011, three new custom cabins were built. Being only a stone’s throw away from the water, the views from their decks are breathtaking. All of the cabins have their own West Coast animal theme and the log furniture throughout is handmade on Vancouver Island. Though the times and owners have changed, the vision of our resort still remains the same. Our resort is an amazing home away from home for all guests near and far. We hope that you come and visit Brown’s Bay Resort so we can share this unbelievable oceanfront property with your family. See you here. 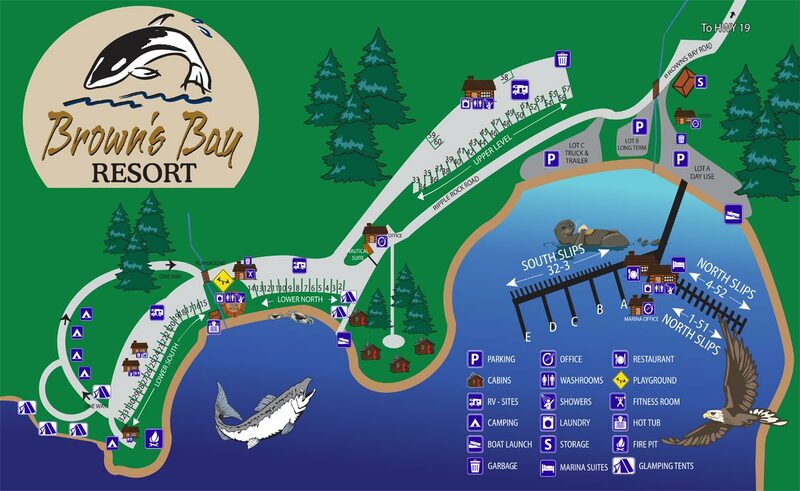 Contact us to make reservations at our beautiful Resort, located on Vancouver Island, British Columbia.